Last year, Internap Corp. hired Morgan Stanley to "evaluate strategic alternatives," but despite the move, the second half of 2015 was a painful one for its shareholders, and the situation hasn't improved this year, which has so far brought a 38-percent plunge in value. This is happening with the backdrop of numerous analysts being bullish on data center stock in general. Internap shares have traded down over 55 percent during the last 12 months, with the share price decreasing 38 percent during the first three weeks of 2016 alone. During the past 52 weeks, INAP has traded in a range of $3.59 - $10.75 per share. Last week, its shares hit a new 52-week low of $3.59 per share, prior to the 4-percent bounce on Friday up to $3.93 per share. This has resulted in Internap sporting a market capitalization in the $220 million range. There is a number of players who may be willing and able to write a check that size, if they can look at the company from the glass-half-full perspective. But the recent global equities sell-off, spurred by China fears and the oil glut, may have potential suitors thinking twice about making acquisitions. As reported by Benzinga in late November 2015, SunTrust Robinson Humphrey analyst Inder Singh initiated data center stock coverage with a positive view of the space, noting that data center traffic is expected to grow by a compound annual growth rate of 23 percent through 2019, when it will reach as much as 10.4 zettabytes per year, citing stats from the latest Cisco Cloud Index. Looking forward to 2016, "Singh suggested that M&A activity in the space will continue for two reasons: 1) wholesale and retail colocation companies are looking to expand their service offerings to become a 'one-stop shop' that can attract clients of all types and sizes, and 2) scale and size is important to attract enterprises that operate across many geographical regions." Singh's top data center stock picks included Equinix and CyrusOne. He initiated Internap with a Neutral rating and a $7.50 target price. Mr. Market - Why the Long Face? Internap operates in a fast-growing sector with remarkable cloud-driven tailwinds. Most Wall Street analysts are bullish about the prospects for the data center industry overall. Since 2014, Internap has been transitioning its business to focus more on hybrid cloud services in addition to its legacy IP and colocation hosting business. Notably, during last year's third quarter, the strategic partnership with Akamai Technologies to deliver cloud security solutions to Internaps's high-performance customers was "…beginning to show results," according to Internap's earnings presentation. However, the company faces a lot of heavyweight competition: Amazon Web Services, Microsoft Azure, Google Cloud Platform, IBM SoftLayer, Equinix, Rackspace, Telx (now part of Digital Realty), CenturyLink, IBM Softlayer, AT&T, Verizon Communications, and Level 3 Communications, among others. These names have deeper pockets and operate at a much larger scale. Scale is a huge advantage when it comes to delivering better margins than Internap posted for the most recent quarter. 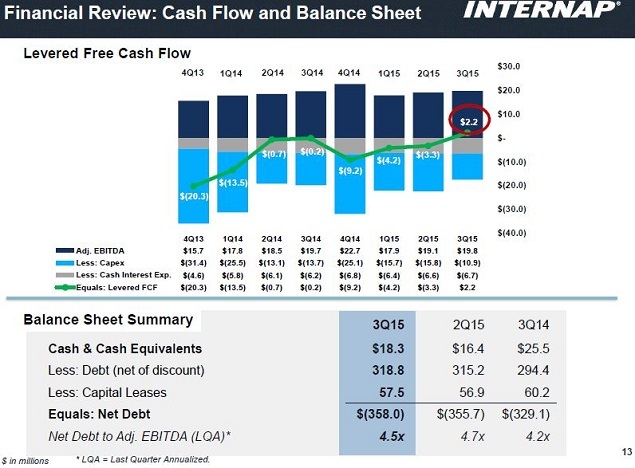 The Internap 3Q'15 earnings print included $2.2 million of positive levered cash flow. This was after reporting seven consecutive quarters with negative LCF, ranging from $20.3 million in 4Q'13 to $3.3 million in 2Q'15, as shown below. While it is always nice to see a positive number, a closer look at the financials shows that in order to post $2.2 million in 3Q'15, the capex was reduced by about $5 million from the previous two quarters. It remains to be seen if adjusted EBITDA growth for 4Q'15 will be offset by capex spending required to support the growth. Alternatively, the focus on core data services could allow Internap to continue to grow LCF with reduced capex moving forward. Internap's large installed customer base, its Managed Internet Routing Optimizer Controller, and other patented technology could lure potential suitors. SunTrust's Singh highlighted the "proliferation" of bandwidth-intensive applications (including video streaming), which "increases the demand for distributed compute architectures to bring users closer to content." "Given that two-thirds of internet traffic is data center-related, the importance of data centers both from a colocation and cloud perspective is significant," Singh wrote. "Data center traffic is the biggest component of internet traffic, almost twice as much as the traffic that transverses IP WAN networks." Rangeley Capital's Andrew Walker made a bullish case for purchasing INAP shares below $4.00 in a Seeking Alpha post last week. He noted the industry trend toward consolidation, Internap's low margins as a stand-alone entity, and its relatively high balance-sheet leverage as rationale for the company being a logical M&A target. He did mention one significant fly in the ointment. There are larger shareholders with a cost basis in INAP shares above a likely buy-out offer, making them reluctant to sell their shares. Additionally, some investors believe that if the company was going to be acquired, it would have already happened. Potential suitors might include Comcast, strategic partner Akamai, and a host of other well-heeled industry stalwarts. Barring any earlier developments, Internap management has promised to update investors regarding strategic alternatives next month, when the company reports results for the quarter ended December 31, 2015.